It is the people of Zimbabwe that makes your trip. Our guide was out of this world and he went above and beyond to make this trip as memorable as possible! Ntando – I salute you! I had the great privilege to travel to Zimbabwe during May this year. 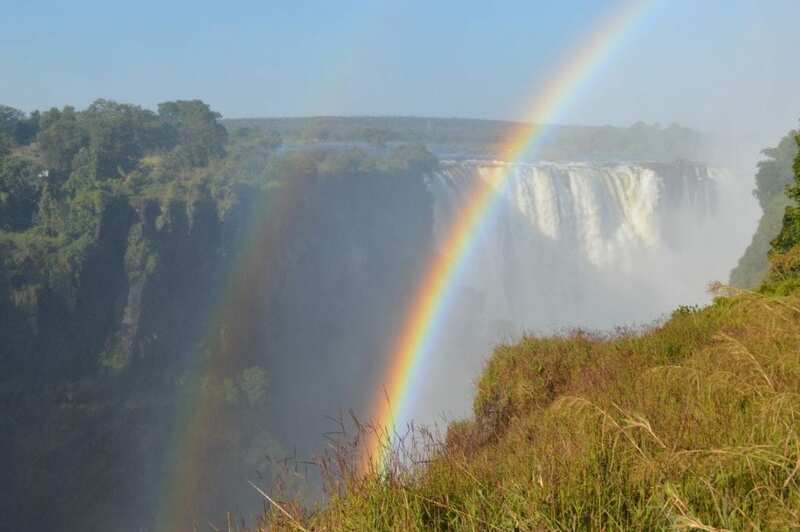 I’ve been to Vic Falls before – but never anywhere else in Zimbabwe. We were a group of only 4 which made this trip extra special. The afternoon of our arrival we did a tour of the falls. The water was amazing. There are no words to describe the massive amount of water that you see in front of you. We were soaking wet by the end of the tour but still able to take the most amazing pictures. For dinner that night we went to the Boma – this is a unique and wonderful experience where you can enjoy a truly African evening with local entertainment and delicious cuisine. Our accommodation for the first night was at Vic Falls Safari Club. 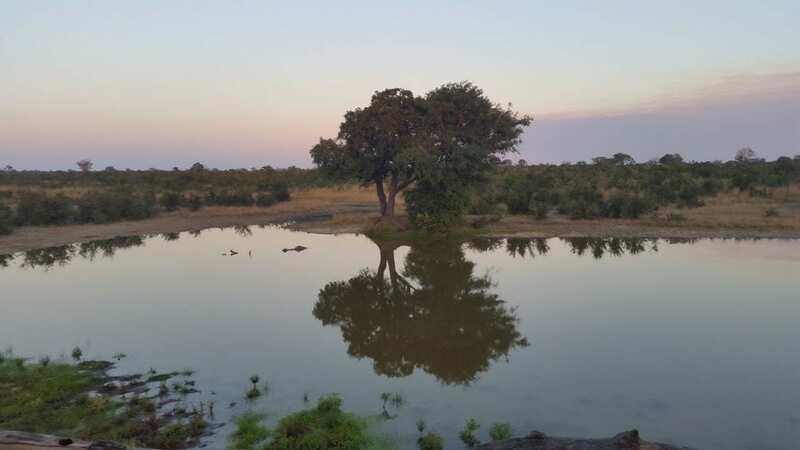 The Club is located on a very unique spot overlooking a waterhole. The rooms are stunning. We left Vic Falls this morning to leave for Binga (approx. 330km). The roads in Zimbabwe are not very good. From time to time you get a good stretch of road but still you can’t drive fast. Driving takes up some time but at least the scenery is good and we did a couple of “pit stops” along the way where we were able to take pictures. 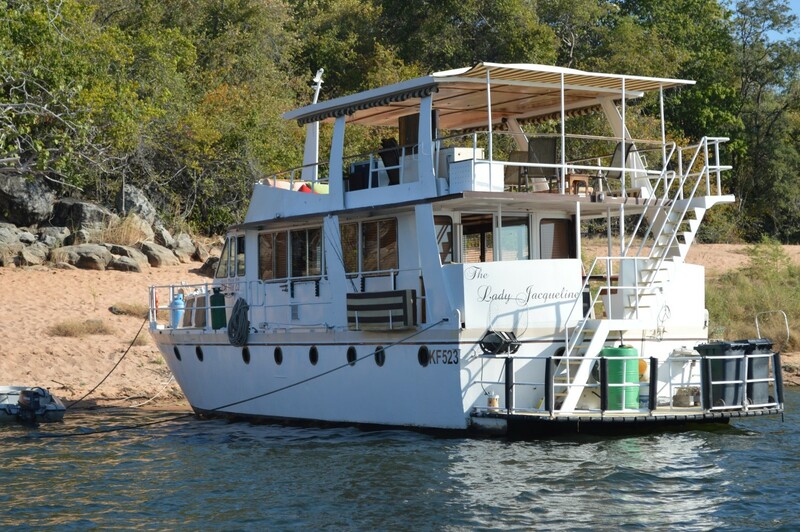 Arriving at Binga (a fishing, boating and cultural centre towards the western end of Lake Kariba), we were met by the Captain of Lady Jacqueline, Steven. He came to fetch us with a tender boat as Lady J was docked down river where they found a great fishing spot. For the next 2 nights we were accommodated on the houseboat which was great! 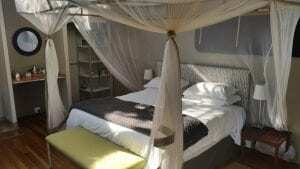 It has 4 cabins which can accommodate 10 people. 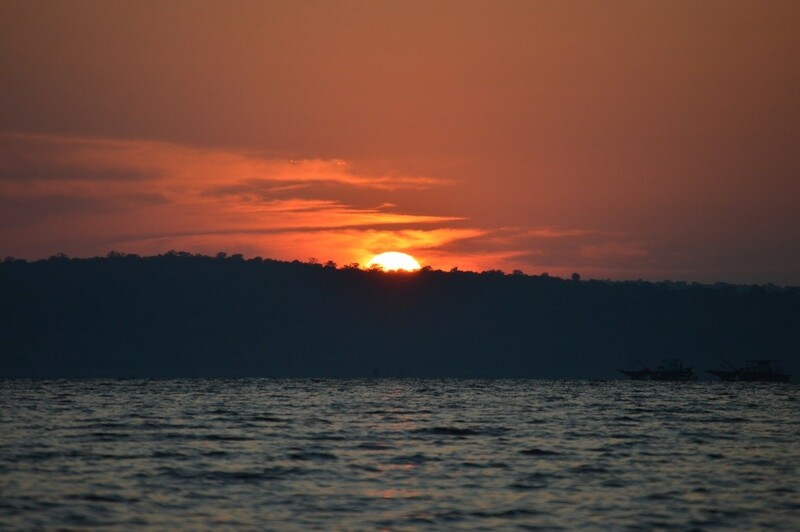 Waking up early and after some coffee and rusks, we left for our fishing trip on Lake Kariba. The local people use some kind of dough for bait and we caught 5 fishes (Bream) which then became our dinner for the evening. We left our fishing spot and the Lady J cruised further down the lake where we tried our hand at Tiger fishing which was much more difficult than catching Bream. It was a great experience with an awesome sunset. We had lots of fun even though we were not able to catch a single Tiger Fish! This morning our Captain took us out on a little tender boat at 05:00am so that we could experience the early morning sunrise and take some pictures. What an amazing experience!. Early morning we left Binga for our next stop: Elephant’s Eye, Hwange Eco-Lodge (approx. 200km drive from Binga). 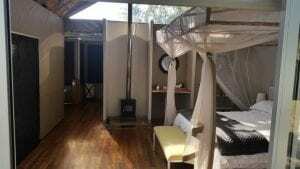 The Lodge is situated about 13km from the main camp of the Hwange National Park. The chef – Nomalanga prepared a lovely lunch for us. After lunch we went on a walking Safari with Josh which was very interesting and also very entertaining. 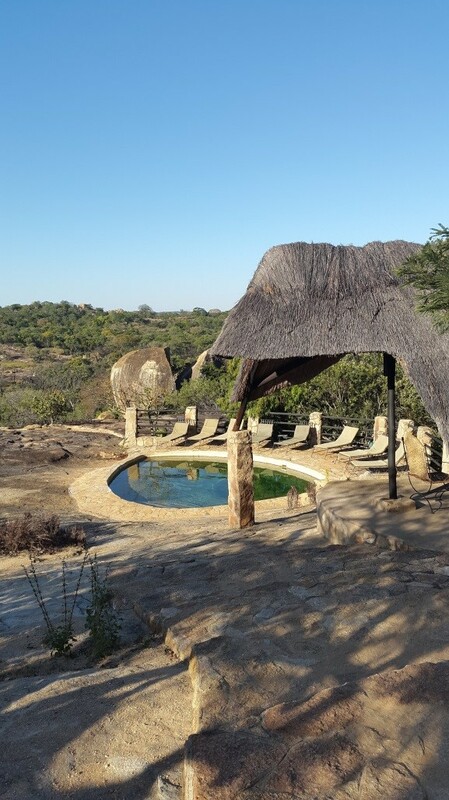 Elephant’s Eye also just completed their “Sleep out deck” where guests can sleep outdoors overlooking a waterhole. This will be a unique experience and is also the perfect place to enjoy sundowners. Dinner was served outside and in the main area where we had a big BBQ. We also did some stargazing with Dollar – one of the guides. 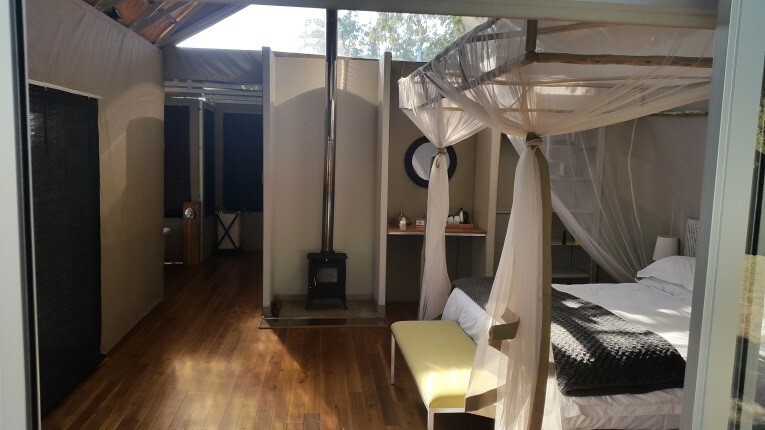 The luxury tents at Elephant’s Eye is absolutely amazing and comes complete with an outdoor shower!! This morning after a lovely breakfast at Elephant’s Eye, we left for our full day game drive in the Hwange National Park. The park is known for all its’ elephants. I’ve never seen so many elephants in one day and we were able to get very close to them! Dollar is a great guide and shared so much information about the park and its animals with us. The lodge packed lunch for us which we enjoyed in one of the camp sites within the park allowing us a full day in the park. We arrived back at camp at 17:00. From 07:00 – 17:00 = 10 hours! It was GREAT! At Elephant’s Eye a huge fire was waiting for us and we sat around the fire until it was time for dinner. Another great day spent at Elephant’s Eye came to an end. After another awesome breakfast at Elephant’s Eye we left for Bulawayo. There were a lot of roadblocks between Hwange & Bulawayo and it is very important to note that you are NOT allowed to take ANY pictures at ANY roadblocks. Not even flowers or trees or anything for that matter! We found the town of Bulawayo to be very busy with Sunday markets and churchgoers. People are less friendly in Bulawayo than in the rural areas. We drove through Bulawayo to get to the Big Cave Camp, Matapos. WOW, is the setting of Big Cave Camp amazing! In and amongst the rocks you will find the pool, rooms, braai area, reception and restaurant area. A short drive in the afternoon and later sundowners on one of the rocks allowed us once again a beautiful African sunset. What a way to wake up.. being able to view the sunrise from your bed. Awesome! We had to get up early as we went for a morning walk with Shephard where we saw interesting rock formations and bushman paintings. We also got to see the camp grounds at Big Cave Camp. The highlight of the day however…. Rhino trekking! The guides are in direct contact with the trackers who guard the rhinos and they therefore know exactly where the rhinos are. We drove to a spot where we left the vehicle and had to walk to meet up with the trackers ….4 heavily armed men!! 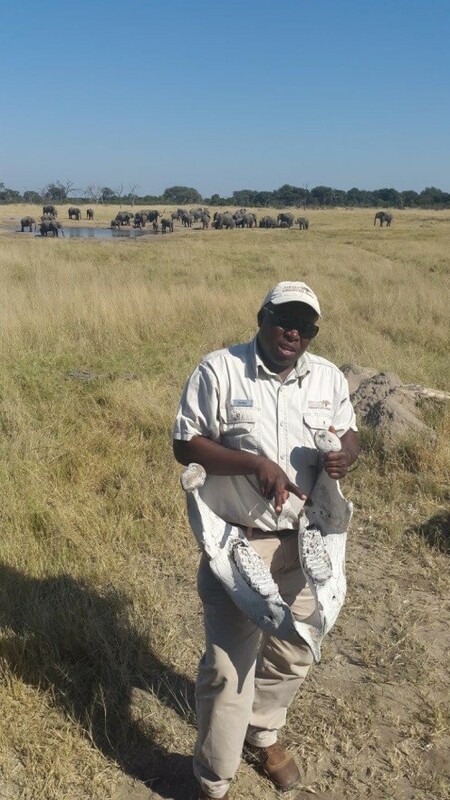 Together with the trackers we walked for about 15mins… and then, there they were – 5 Rhinos! This was a very special, wonderful and unique experience for me which I will always remember. Big Cave Camp is not a big game destination. It is more known for interesting rock formations, bushman paintings, Rhino trekking and nature walks. We had sundowners at the grave of Cecil J Rhodes where the guide shared stories with us about him, the gravesite and monuments. 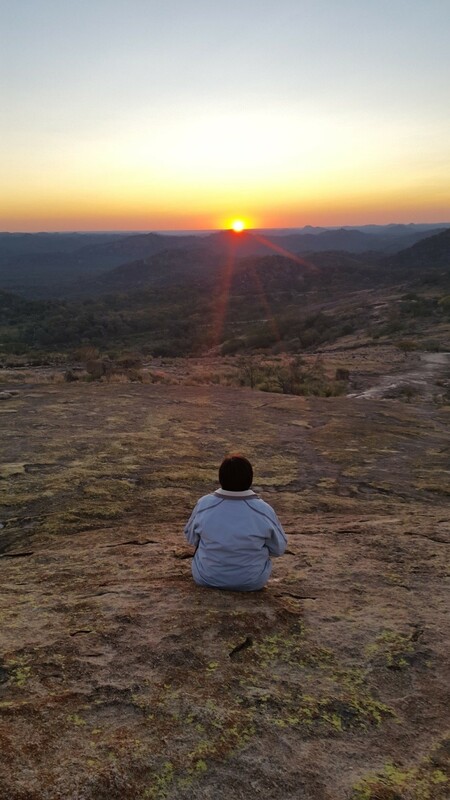 The time then arrived for another beautiful African Sunset….my last sunset in Zimbabwe for now! To say goodbye is never pleasant! We left for home from Bulawayo airport. I have to say that I was very impressed with Bulawayo airport. I can definitely recommend this trip to anyone and I will be going back for sure as my heart is still in Africa.